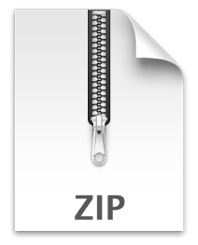 If you’ve ever run into a .zip file on an iPhone, iPod touch, or iPad you will probably have discovered it’s a bit of a dead-end initially, because by default there isn’t much you can do with zips or any other archive format. That doesn’t mean you can’t open ZIP files though, and in fact these archives can be viewed, unzipped, and opened in iOS with relative ease, but you will need to download a free third party app before you’ll have the function included on your device. This will allow you view all of the contents of any zip file quickly, and also decompress the entire archive, or just extract a single file from a larger archive, providing quick access to the zip contents which can be saved locally or opened in another application of choice. Yes, WinZip, the classic Windows-based archive manager that has been around since ancient times has a version of itself for iOS, and it retains the same name from it’s desktop past. Now on iOS, it’s actually a great app that is free, fast, and efficient, and does exactly what we want it to do, plus it handles password protected zips with ease. The only complaint is the developers haven’t yet updated the app for the iPhone 5 resolution so it looks a little weird on that device, but the functionality remains intact and thus allows the (likely temporary) UI resolution oddity to be ignored. There are a few other options on the App Store, but WinZip is really the best choice we have come across. 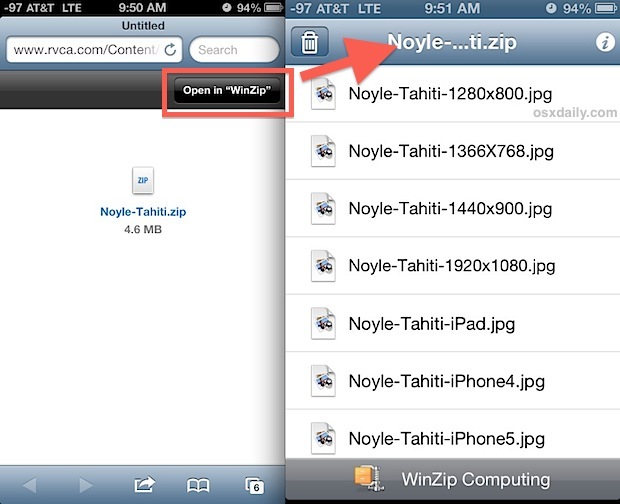 Once you have WinZip downloaded and installed in iOS, you will gain a new option available anytime you run into a .zip file, whether the archive is found on the web through a link, or even if has been included as an attachment to an email. Tapping on any of the individual items within the contents list will show a preview of the specific file, though for now they remain zipped in the archive. To unzip the item you are currently viewing, tap the “Open In” button and choose an option from the action list. In the screen shot example, we are viewing a photo contained within a zip file that contains a variety of resolutions of the same image. 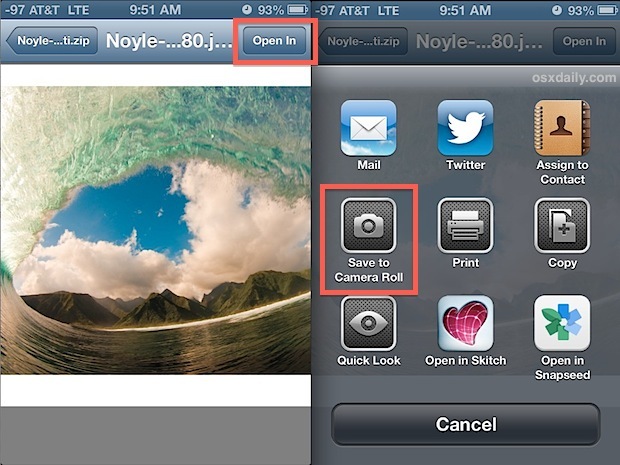 For pictures, you’ll find options to save the image to camera roll, send it through email or Twitter, print it, copy it for pasting elsewhere, and the ability to open it in various compatible apps that you have installed on your iOS device (in this case, Skitch and Snapseed). Enter the password to the zip file to unlock the password protected zip, you can’t unzip a locked zip file without a password. I have tried downloading files to my ipad and home computer- received decompression failed and cannot open file messages. Please help! Cannot open my download. Was hoping to buy a hard copy. I want my money back. WinZip is a free app, you can definitely try asking Apple for your $0 back and they might refund you $0. Call Apple and ask them. How do you find the password needed to open zip file. I know you said to get this app. In one of the comments above thr person stated you still have to enter the password in order to open it. If I had the password then I could open it up when it stated it is in zip lock. Confusing. Yes you must get the password to open a zip file that is password protected. Ask whoever sent you the zip file for the password. I installed the free Winzip app on my IPAD and received a Dropbox folder shared via gmail. I can read a Dropbox text file but I see no way to open a Dropbox zip file. I get the message “To view this file, open it on your computer” HOW? Could I please request that the booklets be mailed to me because I am computer illeterate? Add me to the list of the disinchanted and quite ticked off. I have recently moved from an Android pad to an iPad. My principle box is Win7. A significant number of my Dropbox files are password protected with Winzip (I’ve been a Winzip user since version 1). I tried the free version on my reciently aquired iPad. NoGo. Bought the pay version which made no difference. Fortunately my cell phone is Android which means I can view them there as long as I have both units with me.